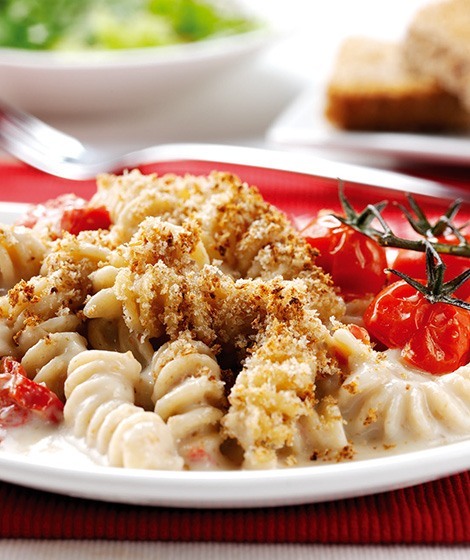 A simple Whole Grain pasta bake to satisfy that hunger. Cook pasta according to pack instructions, drain and return to the pan. Meanwhile, melt the butter in a small saucepan and stir in the flour, cook gently for 1 minute. Gradually stir in the milk. Bring to the boil, stirring until thickened and stir in the cheese until melted, season to taste. Stir into the pasta and transfer to an ovenproof dish. Sprinkle with breadcrumbs and place under a preheated grill until golden. Serve with a fresh crispy green salad. Roast off 250g cherry tomatoes drizzled with a little olive oil for 15 minutes and stir into the pasta with the cheese sauce.